I created a card for the latest Little Tangles challenge Into the Woods! I haven't played along is such a long time, but I have so many bloggy friends on the Design Team over at Neat & Tangled I just have to play this time. Little Bear is one of my favourite Neat & Tangled stamp sets and it was also one of my first. The challenge this time is to use some kind of natural texture on your projects. I selected some October Afternoon Campfire paper I have been hoarding for a long time and cut a square of star gazing for my background. Then I pulled out some cork and inked the huge speech bubble up to stamp on it and then fussy cut. I stamped the other images and used Copic markers to colour them in before I fussy cut them. This project is a bit out of my comfort zone but we need to push ourselves sometimes to see what we can do. This is so sweet! I love the cork speech bubble! 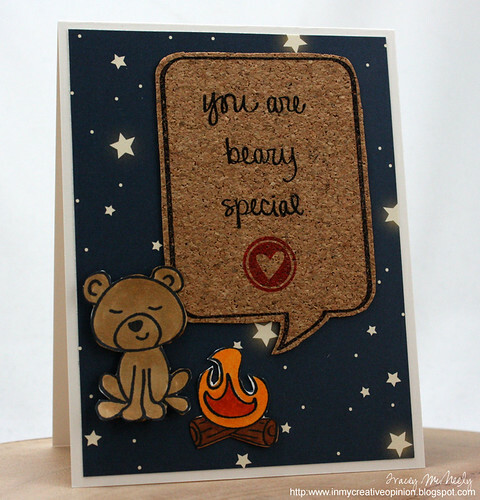 And the gorgeous paper with the sweet bear by the campfire! Sweet card Tracey! I have this OA paper too, hoarding it too!! It's perfect for your night campfire sky. cute little guy..love your night sky too! Adorabel Tracey! This will be my first set as well . I ordered this set a few days ago because I wanted some more sequins, and it just caught my eye! aww this is beary cute.. This is just perfect. I love your cork speech bubble, and such a cute sentiment--with that little heart. I never thought to stamp on cork. Your paper is just perfect for this card. Good thing you have lots of papers to choose from. I love that cork! I bought some a while back and really need to open it up. This is such a sweet little bear! Love that starry night too! Beary Beary cute:) You know how much I love cork! This is awesome Tracey! thanks for playing along with us at Little Tangles! Adorable card! The background paper is perfect and I love the cork speech bubble! The sky paper is awesome and I love the cork! That bear really is beary cute (tee hee!) and I love the cork speech bubble! Tracey, this is just too cute! Love that sweet little bear hanging out by the fire. Tracey this is the sweetest thing! I love the deeper colors...such a cute night scene! So, so sweet! Love the starry sky!